Another solution to my great breakfast dilemma arrived this week from the CSA in the form of tomatillos. I love these little green beauties. They are tart and tangy and when you cook them down they develop a light creamy consistency. They also happen to pair really nicely with eggs. This is not the type of dish you’d whip up on a Monday morning before work but I think it’s nice to have some special brunch dishes in your back pocket. Whether you choose to break this out when guests are coming round or feel that a quiet Sunday morning with the family is reason enough, this casserole is a real crowd pleaser. Just a quick read over the ingredients will get your taste buds tingling. Eggs, chorizo, cheese, cumin, jalapeno, and of course tomatillos. Yes, please. Reduce the heat to medium-low and add the oil. Add the onion and jalapeno and cook, stirring, about 5 minutes, until the onion has softened. Add the garlic, coriander, and cumin and return the chorizo to the pan. Cook, stirring, for 1 minute. Stir the queso fresco and cilantro into the tomatillo mixture. You can choose to bake directly in the pan in which you cooked the tomatillo mixture or pour the mixture into a medium baking dish. Carefully crack the eggs over the top of the tomatillo mixture. Bake, uncovered, for 12 to 15 minutes, until the whites are just set but the yolks are still runny. The eggs will continue to cook when they are removed from the oven. (If you are cooking the eggs on a tomatillo mixture that was made earlier and brought to room temperature, they may need to cook 2 or 3 minutes longer to fully set the whites. *) Serve sprinkled with more cilantro and with warm corn tortillas alongside. * Because I am completely obsessive about my recipe writing, I feel I need an even more extensive note about the cooking time of the eggs. After testing this recipe twice (once with a hot tomatillo mixture and once with a room temperature tomatillo mixture), I did a little research into other baked eggs recipes. Turns out, the cooking time for the eggs is all over the place. Some recipes called for 5 to7 minutes. Some called for 8 to 10. And others called for as long as 18 to 20. The upshot is, egg cooking time can vary greatly. You’ll have to use your judgment when cooking them. Everything from the temperature of the tomatillo mixture to the vessel you cook them in will affect their cooking time. (For instance, if you crack the eggs right into the hot skillet you cooked the tomatillo mixture in rather than transferring to a baking dish, you’re going to have a quicker cooking time.) Keep an eye on the eggs and look for the whites to just turn opaque. And remember, the eggs will continue cooking after you pull them from the oven. 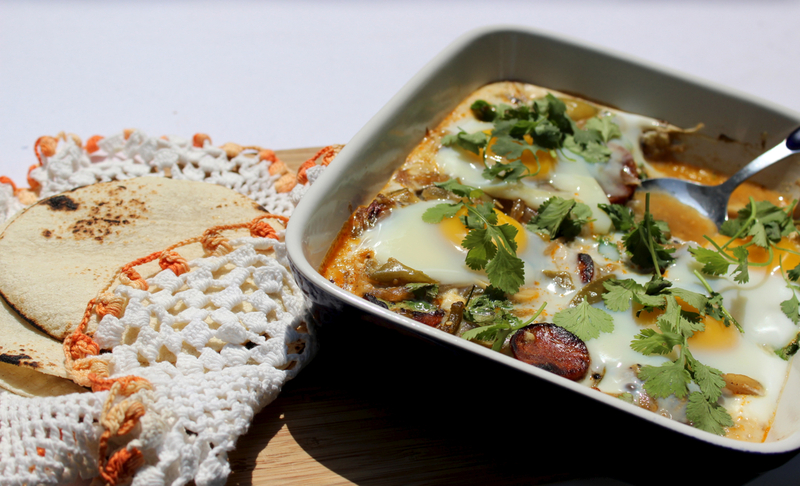 This entry was posted in breakfast, brunch, lunch, main, Uncategorized and tagged baked eggs, cheese, chorizo, eggs, tomatillo. Bookmark the permalink. Another version, v pantry friendly: tomatoes (canned fine) for tomatillos, no chorizo, same cheese/no cheese/dollops goat cheese/feta. Same spice profile. Serve with labeneh or stiff greek yogurt, flat bread. Stays presentable at room temp. Your blog is great, so much fun. Thanks Tai, this is a great pantry option. Glad you are enjoying the blog!